At Vail Resorts, everything we do is built upon the promise of bringing together the mountains, our communities, employees and guests to ignite a passion for the outdoors, conserve the natural environment and support our local communities for a bright, sustainable future. Leading the charge on this mission is Vail Resort’s EpicPromise. 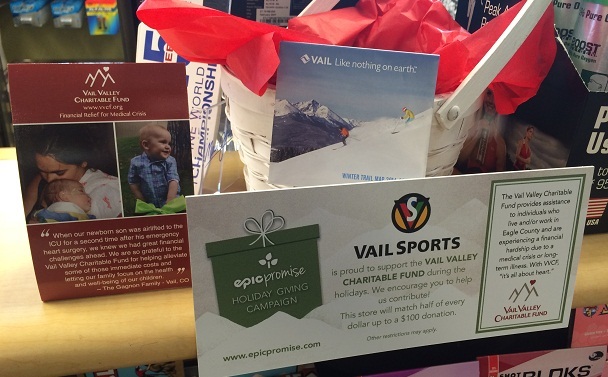 One EpicPromise initiative over the last decade has been the Annual Holiday Giving Campaign, a matching funds program with Vail Resorts Retail that matches .50 for every $1.00 donated, on contributions up to a $100. We are proud to announce that this year’s Eagle County recipient of the program is the Vail Valley Charitable Fund (VVCF). The VVCF’s mission is to provide financial assistance to Eagle County locals experiencing a medical crisis. When an accident, illness, or medical catastrophe occurs, the VVCF is there to help. Due to a much higher cost of living in Eagle County, the scarcity of affordable health insurance, and high co-pays and deductibles, a responsible working person can quickly become financially disabled if he or she is faced with a medical crisis. Founded in 1996, the VVCF has distributed more than $7 million to assist over 1,300 residents. More than 85% of funds raised by the VVCF go directly to assist locals in need. A serious illness or injury not only affects the patient’s ability to make a living, but it affects the caregivers as well. Time off work to go to doctors’ appointments, physical therapy, and chemo plus taking care of children… all are necessary tasks that can mean a reduced second income. Medical crises are the most common causes of personal bankruptcy in the United States and financial barriers frequently stand in the way of focused medical treatment and recovery. The VVCF helps those living and working in Eagle County, not only with direct financial assistance, but also by negotiating discounts, setting up payment plans, paying down financial obligations to a manageable level and helping cover the cost of routine living expenses. This allows those in crisis to focus their attention on healing. Most importantly, we offer hope. From November 28th through January 9th, all 50 Vail Resorts Retail stores in Eagle County will collect donations for the VVCF. EpicPromise will match .50 to every $1 donated, on contributions up to $100. Funds raised by this campaign will go a long way to help Eagle County locals in need!